Biomass boilers burning wood pellets are sophisticated pieces of kit. Oliver Duckworth of Windhager UK gives an insight into their complexity and capabilities. With a drive for all of us to reduce carbon emissions and install renewable heating systems, biomass is seen as one of the most favourable technologies to make significant carbon savings to both our new-build properties and also to our more carbon-intensive aging housing stock. With the Renewable Heat Incentive (RHI) up and running for domestic properties now as well as commercial properties there has been a significant increase in the demand for high-quality biomass wood-pellet boilers. With interest increasing from all market sectors from private and social housing to schools and hotels, wood-pellet boilers are already becoming a mainstream choice when it comes to implementing cost-effective and reliable renewable heating projects. Modern wood-pellet boilers offer levels of automation matching traditional gas and oil-fired boilers. Ideally suited for both new-build projects or the direct replacement of existing fossil-fuelled heating appliances, the installation of biomass wood-pellet boilers is becoming widely recognised and specified as a major heating system solution to reduce both carbon emissions and running costs. Wood pellets are manufactured to the EN plus A1 standard which provide the highest levels of combustion efficiencies, low emissions and low ash content combustion. Wood pellets are now manufactured in the UK and distributed to all areas of the country. There are several manufacturers of wood-pellet boilers. Windhager, for instance, manufactures a comprehensive range with outputs from 1 to 240 kW. Appliances with outputs up to 26 kW can be hand fed with 10 kg bags of pellets or connected to an auto-feed system with a bulk hopper. Appliances over 26 kW are only available with auto feed systems fed from bulk fuel hoppers. Cutaway showing the internal components of the Windhager BioWIN Excel. Bulk hoppers are filled with pellets which are blown from delivery tankers in a similar way to oil deliveries. Hopper solutions with capacities of up to 10 t or bespoke hoppers can be constructed on site. A patented pellet suction system conveys the fuel from the bulk hopper to the boiler via pellet suction pipes, with a distance between the hopper and the boiler of up to 25 m if required. Multiple suction points placed on the base of the hopper ensure that pellets are not degraded when sucked from the hopper to the boiler and that the hopper is evenly emptied. If a blockage is detected the changeover unit can even reverse the suction process to blow down the suction line to clear any obstruction. Such a suction system has no moving parts in the pellet hopper, so it is more reliable than traditional auger feed systems. 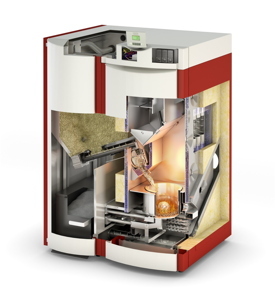 When pellets have been either hand feed or automatically fed to the hopper integrated within a pellet boiler they are then automatically fed into the combustion bowl — and it is here that the expertise from years of development and innovation into production of high-efficiency pellet boilers really starts. All our pellet boilers, for example, offer fully modulating outputs with auto ignition and auto cleaning features. Combustion of the wood pellets starts in the patented stainless steel combustion bowl. Pellets are drop fed into the burner bowl via a variable-speed auger from the pellet hopper. In the base of the burner bowl is an ignition system that initially ignites the wood pellets as soon as a demand for heat is received by the control system; once the pellets have been ignited, the ignition element is automatically switched off and the boiler combustion control operates in a modulating mode of operation, continually monitoring and adjusting the pellets being feed into the burner bowl and fan speed to ensure high levels of combustion efficiencies in excess of 90% are continually met. It is not just the accurate control of combustion that achieves high efficiencies; ensuring that the ash is removed from the combustion bowl and that the heat-exchanger surfaces are clean to ensure the efficient transfer of heat are also vital to ensure operating efficiencies are maintained. The combustion burner bowls and heat exchangers of our boilers have automated cleaning systems. Ash cleaned from the combustion chamber and heat exchangers is automatically conveyed via an auger to an integrated ash bin. The BioWIN 2 range of pellet boilers has an ash container that will accept ash from 4 t of combusted pellets, whereas the BioWIN Excel has an ash container that will accept ash from 8 t of pellets. With this level of automation some appliances need only to have the ash removed and the burner bowl cleaned as little as once a year. Two Windhager BioWIN 60 kW Excel biomass boilers installed in a purpose-built plant room. This also houses an integral wood pellet store and 1500 l accumulator tank. At the heart of many modern pellet boilers is a sophisticated electronic control system that continually monitors the boiler’s functions. Customers can easily access a user level which will provide basic information such as when the boiler next needs to be cleaned and how many pellets have been consumed. A clear text menu displays boiler information and will automatically inform the user when the boiler needs to be cleaned. A service level can be accessed by trained engineers to provide further system information and to allow the system to be correctly set up and commissioned. Some manufacturers offer total control of the system. Our weather-compensating electronic control system automatically adjusts the heating output and boiler setpoints to ensure continuous high levels of operating efficiencies according to varying external weather conditions and user requirements. This control system allows a wood-pellet boiler to be directly connected into a traditional radiator system or a modern underfloor heating system without the need of a buffer tank. The control system provides clear text displays and is complemented with a range of modular distribution manifolds and pumps sets. Options for remote access control systems are also available using an app. Most manufacturers of biomass boilers offer comprehensive technical assistance from initial system design to technical and after-sales help. 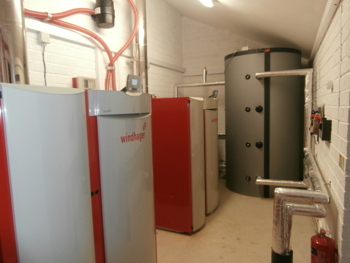 Some, like Windhager, have HETAS-approved training facilities to provide the highest levels of training, ensuring installers are provided with full technical and product knowledge, providing peace of mind for installers, specifiers and consumers when implementing a renewable, low-carbon heating solution. Oliver Duckworth is managing director of Windhager UK.